It’s a beautiful, sunny day as I throw open all of the windows in my room, open my arms wide and exclaim, ‘Buongiorno Venezia!’ ala Katherine Hepburn. Exactly as I had dreamed of doing for so very long. As I gaze down the canal what do I see? What is this? Oh no………. a behemoth of a cruise ship slowly passes by in the distance, towering over the buildings, obstructing any further view and shattering the serenity of the moment. Damn! A few minutes later, another makes its way through the Giudecca Canal across my field of view . Double damn! A few photos before it arrived. 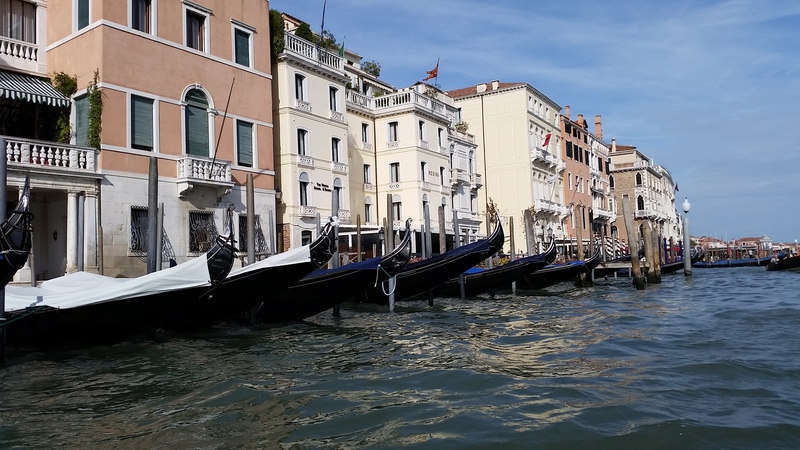 Today we are taking a Walking & Gondola Tour of Venice. The Boys and I decided to meet for the tour at the Palace Gardens where the tour was to start. It seems that if you ask someone in Italy how far it is to a destination, the answer is ’10 minutes.’ Kind of like how long it takes for any take out order at a Chinese Restaurant. It is always 10 minutes no matter the time of day or size of the order. Since I had not yet been to this area I decided I would take a trial walk. It took me over a half hour! But of course, I took a few photos along the way and really had no idea what route to take. I since discovered a more direct route but it still takes longer than 10 minutes. 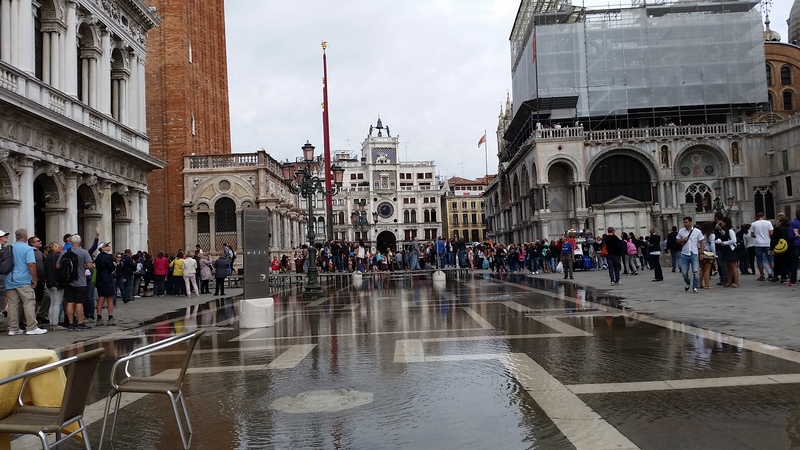 When I arrived in Piazza San Marco, there was water in the Piazza and the passarelle had been set up. Passarelle are wooden planks on iron supports – they remind me of tables – they are rather high, and since they are lined up end to end it is quite a step up if you don’t start at one end. It had also become overcast and I hoped that this would be temporary and the sun would return. The water was only about an inch deep with several spots that you could walk through if you picked the right route. It was late morning and perhaps it had been deeper earlier in the day. I was beginning to have some difficulty with my left leg so I started making my way back to the apartment to get my cane. On the way I stopped for lunch at a local place and ordered a pizza. I have to say I was again, disappointed with pizza in Italy, although I know I didn’t make the wisest choice this time. I love the crusts and the cheese, but it’s the toppings that just don’t do it for me. I ordered pizza Funghi Salamino – mushrooms and slices of a spicy type of Salami. As I said, poor choice on my part, I shouldn’t blame the pizza right?!? Also you don’t get the option of taking home any leftovers at restaurants. Pizza’s are all personal size, well maybe 2 person size? They are about 12″, way more than I can eat. So a pizza is really not the thing to order by myself. A few photos of my morning journey. By the time I’d finished lunch and returned to the apartment, it was time to make my way back to meet the Boys. I tried calling Richard several times to find out exactly where they were. As soon as his phone connected, a recording came on. The problem, it was all Italian and I had no idea what it was telling me. I kept hanging up and trying again. We figured it was probably his default voice mail because he never set it up. We don’t know why it picked up right away. Finally, I tried Dennie’s phone and I had success with that. When we returned to the US, Richard found out he was over-charged for these phone calls that I had made to his phone. Once we met up it was decided we should do a bathroom stop before the (2-1/2 hour) tour and made our way through a few Calli to the Public W/C. Again, it was quite clean despite what Rick Steves said about using public W/C’s. Public W/C’s cost €1.5 and have an attendant working in them that are constantly cleaning up,thus they are not dirty so I never minded paying the small fee. The Boys had purchased a card that gave them free access to them, I don’t remember how much they paid for the card, but that is an option if you are so inclined. While waiting for the tour to start, Dennie struck up a conversation with 2 gals from Australia and we all hit it off right away. They were loads of fun and had traveled together before. Their sense of humor was the same as ours and I could imagine travelling with them would be quite a bit of fun. They were on a 9 week holiday! We were continually amazed at the amount of time people from other countries were able to take for a holiday. Sure is a whole lot different than here in the US where 3 weeks is the norm. Once everyone was gathered that had signed up for the tour (about 20 of us) we were given colored stickers to wear and headsets and were on our way. The first stop of the tour was actually the Gondola part of the tour and we were led to a spot where there were a few waiting Gondolas. The tour leader kind of shuffled the 5 of us and one other woman off to the first Gondola. We noticed that no one else was being sent this way. However, we were so busy laughing and having a good time to pay too much attention. It isn’t all that easy to get into these things especially with minimal use of one of my legs. The seats are very low and I made the comment I might never get up from it. There is a guy who stands outside the Gondola on the Calle and puts his hand out, not his arm, just his hand. This is supposed to help you get in and out. There isn’t anything to hold onto on the Gondola to help steady yourself so I was for once, glad for having my cane! 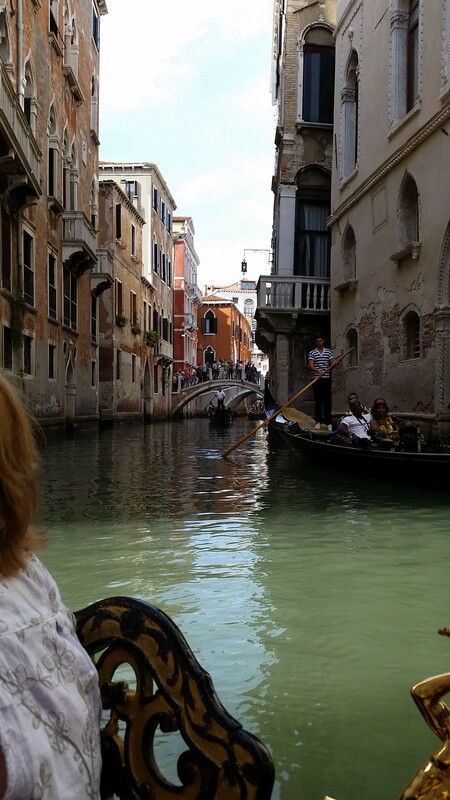 When we got on and off, it was about a 2 foot step into and out of the Gondola due to the water levels of the canals. I had visions of my taking this guy down were I to actually hold onto his outstretched hand. 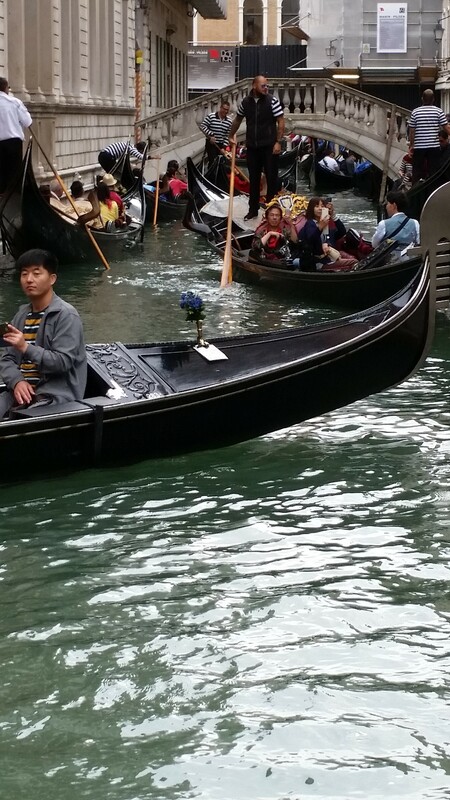 The Gondolier, who was inside the Gondola, simply told us where to sit to balance the weight. Once we were all situated we were on our way. Our first Gondola ride!!!!! I don’t think we ever stopped laughing and carrying on the whole ride. It wan’t a guided tour but I really should take another ride and pay closer attention. 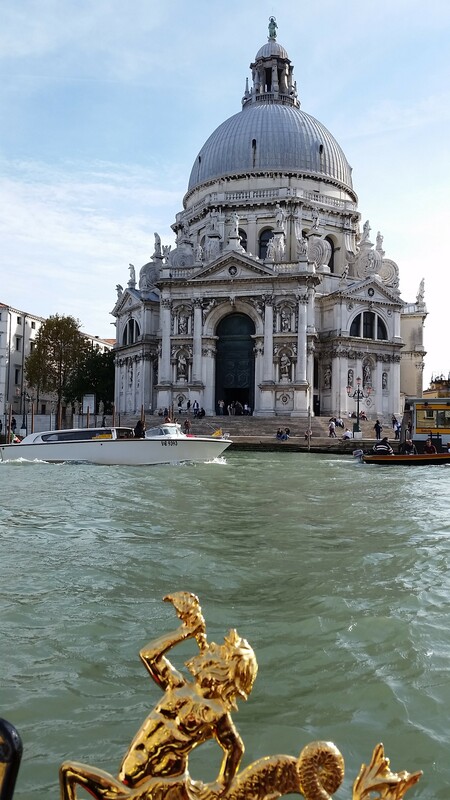 However, when we headed out from a small canal onto the Grand Canal in front of Santa Maria della Salute? Oh you can bet we paid attention. It is a sight to behold. Since the sun had come out before we started the tour, it was absolutely breathtakingly gorgeous!!! It is jaw dropping actually. 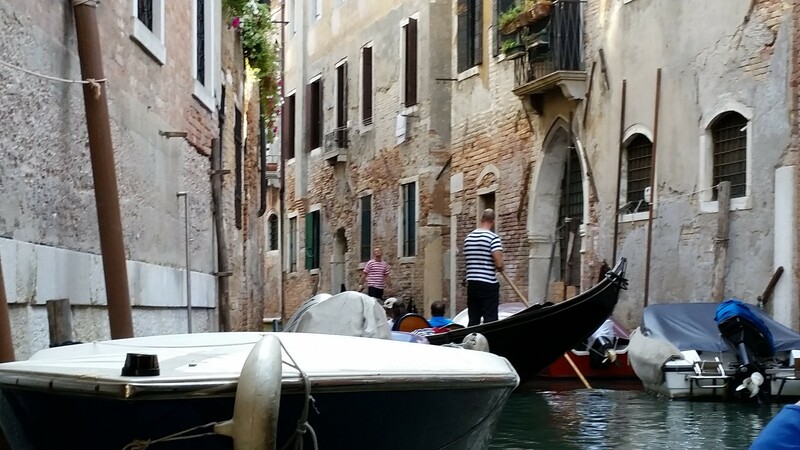 The Gondolier paused so that everyone can get plenty of photos. 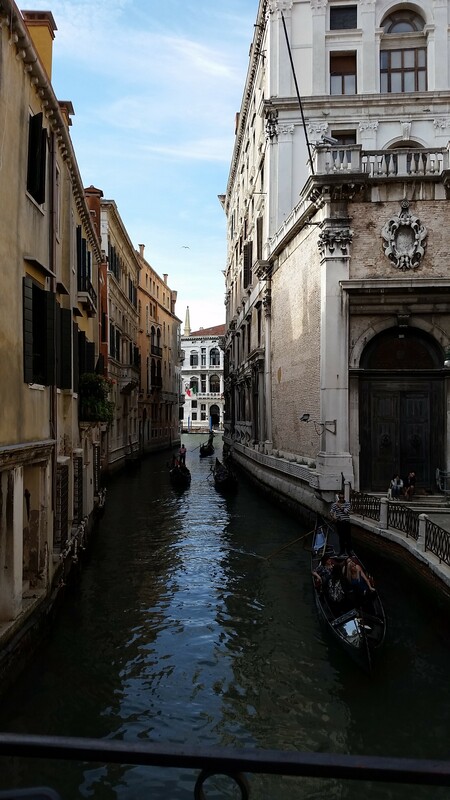 You cannot help but gasp as you make your way onto the Grand Canal on a Gondola, there really isn’t anything that can prepare you for the view – I would recommend it to anyone – it was a very different experience than when I stood outside Piazza San Marco looking across the canal. 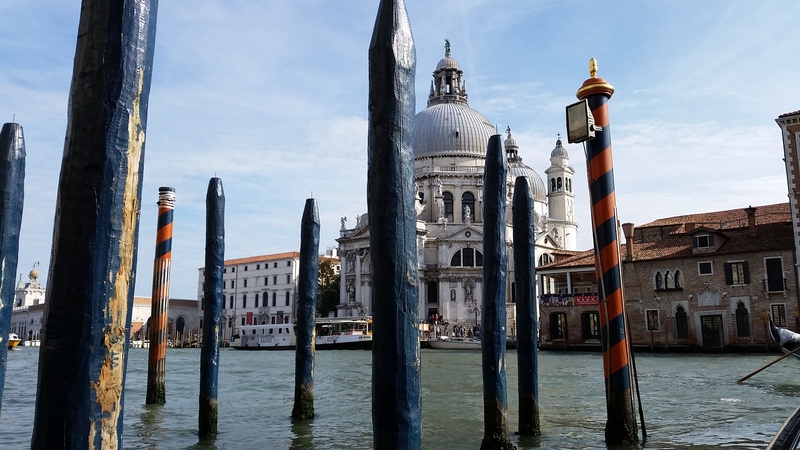 Just being on the Grand Canal at the waters level is very cool. 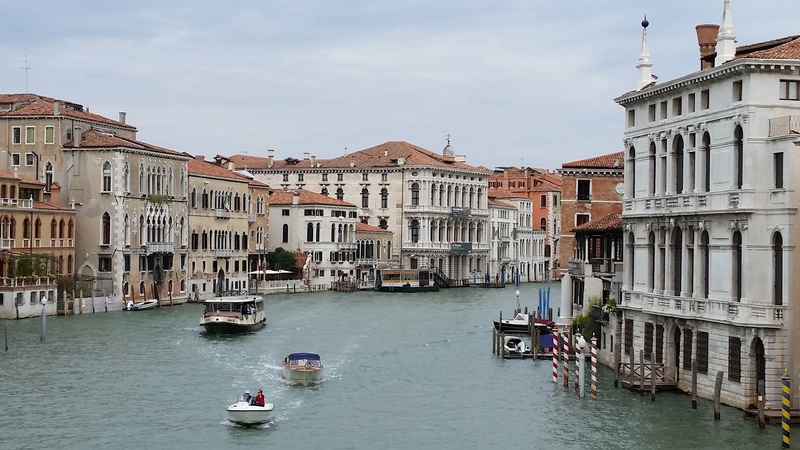 Seeing any of Venice from this vantage point would be truly remarkable. I did snap a few photos amidst the laughter and gaiety of our little group. We made our way back to the starting point. 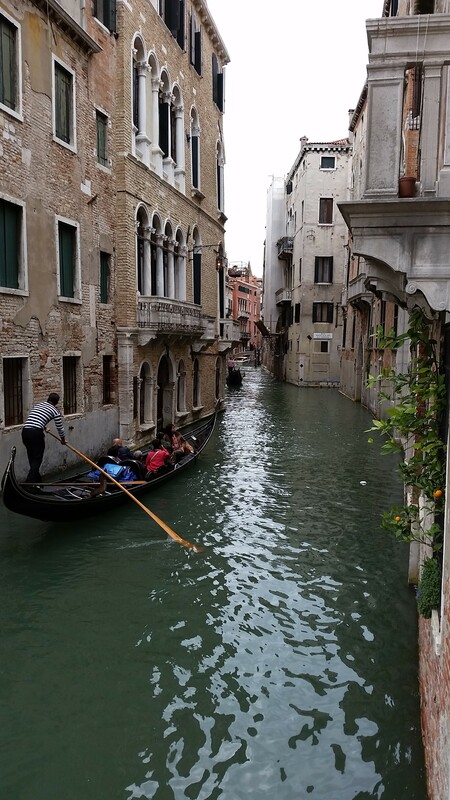 When we got off the Gondola, we asked where to go but the Gondolier didn’t have an answer for us. We looked around and didn’t see anyone with the colored stickers that we were wearing. Hmmmm…..perhaps there really was a reason that we had been shuttled off so quickly in the beginning? Were we known as the Party Gondola since we were having so much fun and goofing around? Were they trying to get rid of us? We waited for a bit never seeing anyone from our tour group so Richard made a phone call. 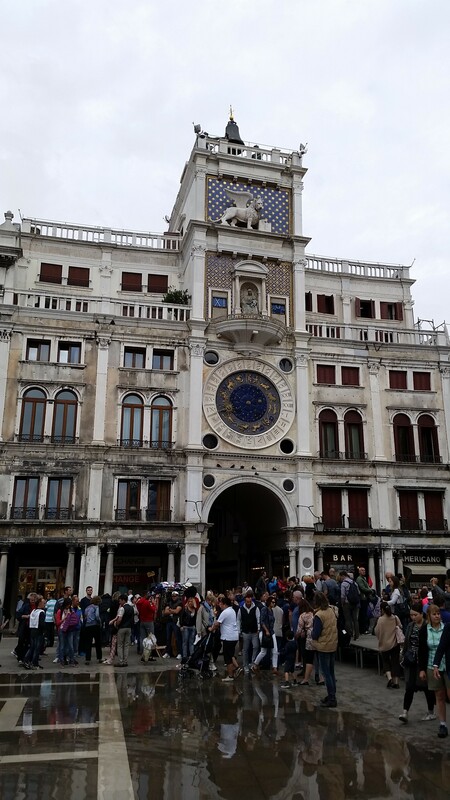 Turns out we were supposed to meet elsewhere once we were done with the Gondola tour. Maybe they told us that and we were just too busy laughing to hear it? Either way, we had an awesome time and we met up with the tour group to continue on to the walking portion of the tour – this was the much longer part of the tour. Our tour Guide was a young, good looking, Venetian. Aren’t all Italians good looking??? Being a Venetian he lent some interesting viewpoints that perhaps another guide may not have. It is sad to think of the juxtaposition Venice is put in between the revenue generated by tourists, and what tourism is doing to their city. There certainly doesn’t seem to be any easy answer as they need the revenue to survive, yet the constant barrage of people and cruise ships is hurting the fragile environment. As a tourist, I feel bad for the citizens and hope that I am at least a conscious, respectful tourist while I am there. Or anywhere I visit for that matter. I certainly would hope that Venice will be there for everyone, including it’s residents, to enjoy for generations upon generations to come. 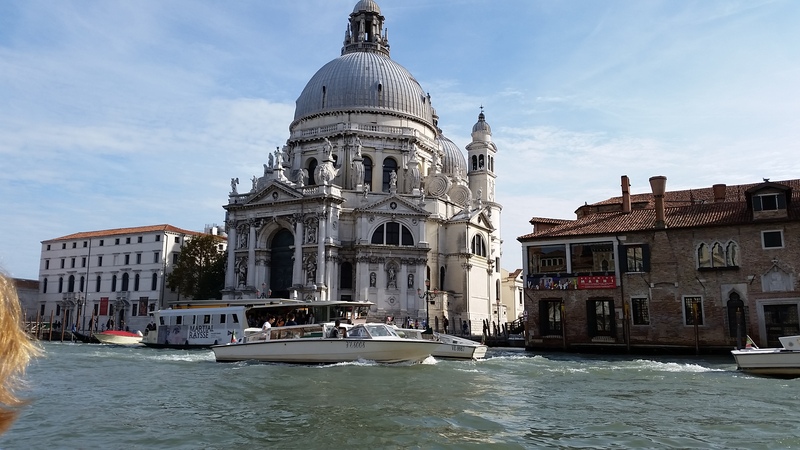 As we make our way onto the Grand Canal, wait for it…. 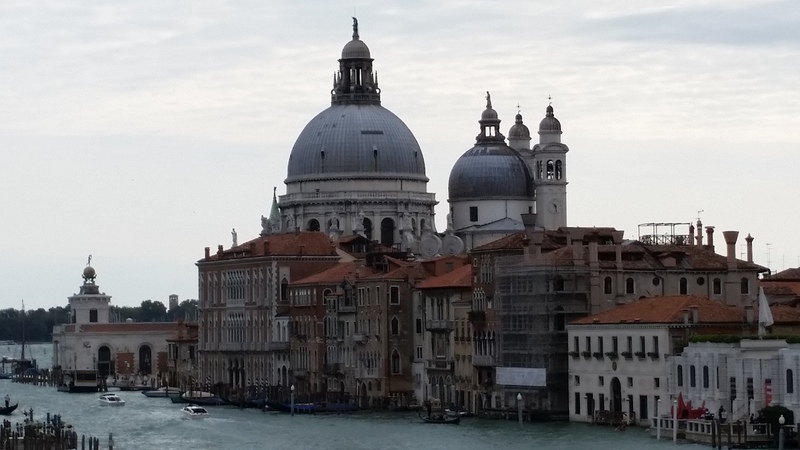 And there she is, Santa Maria della Salute. Bellissima! Dennie took a few more photos of us 3 gals, I got their email addresses to send pictures, and said our good-byes and went our separate ways. Dinner was next on our agenda and we headed back in the direction of the apartment. 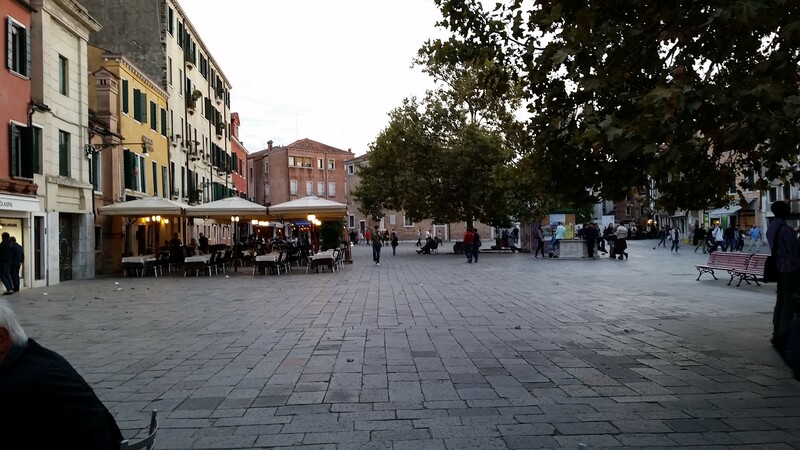 We wandered around Campo San Margherita deciding to dine outside on the ‘authentic’ side of Osteria Do Torri on Campo Santa Margherita. The other side was Italian/American with cheaper prices and no doubt, not as good as it catered to what Americans expect Italian to taste like. Our waiter was a whole lot of fun asking us where we were from then stating, ‘No let me guess. California?’ We laughed and said no ‘Illinois’ to which he replied, ‘Ah… Ill-i-noise’ emphasizing and pronouncing it the way so many from outside Illinois do. We asked him what the other side of the restaurant was all about and he said it was much cheaper and for tourists not wanting real Italian food. Richard and I had been talking about trying a Bellini but were not sure if it was appropriate to have one before dinner, so Richard asked. He laughed and asked why we wanted to know if it was appropriate or not. Richard said that we didn’t want to be committing any kind of faux pas like ordering a Cappuccino after noon. He really got a kick out of this and said, ‘Let me tell you this. A man orders a $300 bottle of wine. If he wants to order a Cappuccino after his dinner? Who am I to judge? He can order anything he wants. You are the guest. 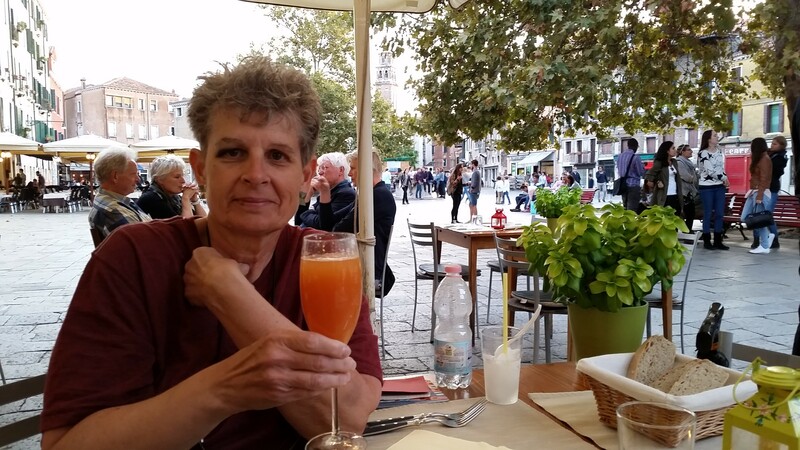 Please, let me make you a Bellini! So, I make you a Bellini?” Richard said yes and shortly I agreed to have one as well. Dinner was fantastic but I didn’t have any room for dessert. The guys had Tiramisu as you can see below. I think maybe, I might have stopped for Gelato on the walk home? I mean, there is always room for Gelato right??? All in all I ended up walking 9-3/4 miles today. 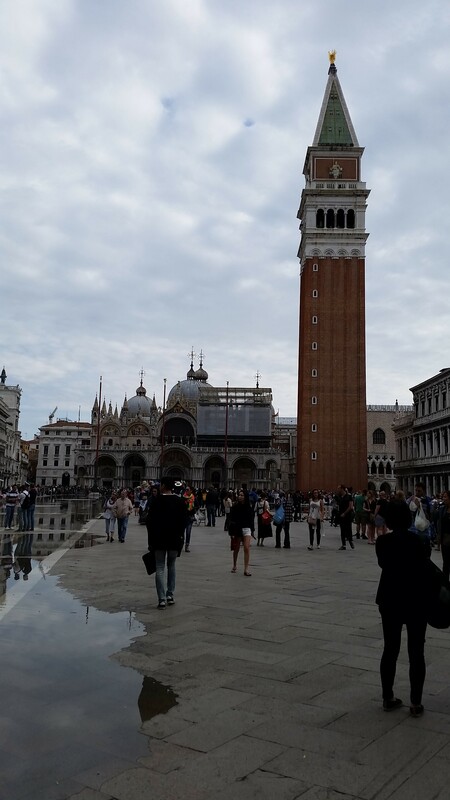 I am looking forward to my first full day to explore Venezia tomorrow. Rae, this is an amazing accounting! You made it all come alive for me…it’s been years since Ivw Ben back but my days there are lovely happy memories…and I’m just so happy you went on the gondola! And funny that people thought you were from California! As for the cruise ships they are canker sores and blights but bring lots of money in…so I don’t know that they’ll ever be stopped. Anyway, thank you so much for this blog and your gracious writing!!!! No they will always be there, but the hope is that they will be banned from coming so close as I noted. Love, love your blogs! You have an amazing way with words! I love all of your photos and your vivid descriptions of the places you visited. It makes for very interesting reading! And I chuckle at your humor. Never stop writing! Thank you for allowing me to go along with you on this journey. Rae-This is fantastic reading. 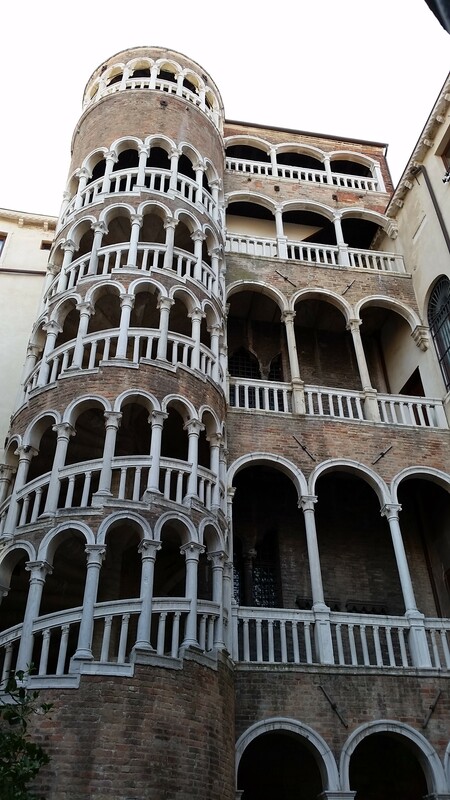 You certainly included so many details…I am impressed..reading this took me right back to Venice…and your photos are lovely…Excellent! 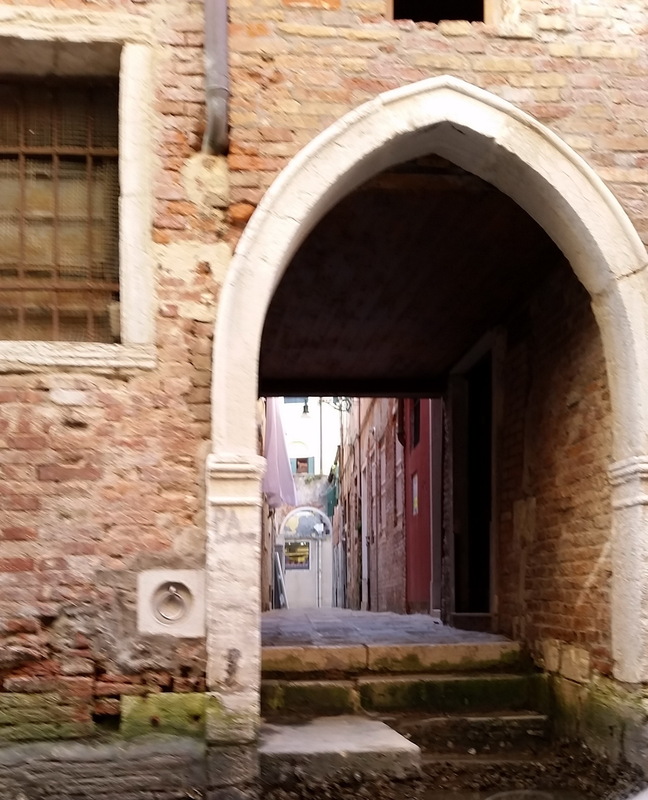 I like how you share your perspective on the challenges of Venice finding a middle ground between tourism and holding on to their fragile environment. Brava! Thanks Margie. I always think my posts are too short and not enough detail because I forget so much, so I’m glad that it was enough to take you back. 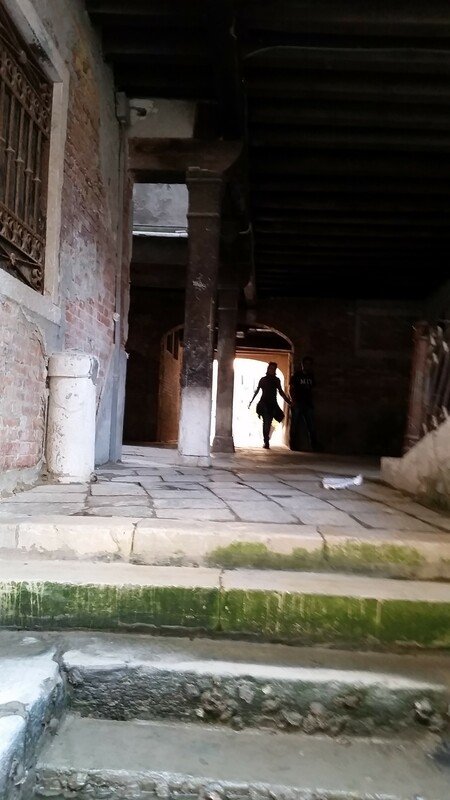 I also hope that Venice can find that middle ground because it is too precious to allow it to crumble.